People who know me are aware of my love of books but may not know that I enjoy picture books every bit as much as novels and works of non-fiction. For those who don’t know me, start here (My Love Affair With Books). 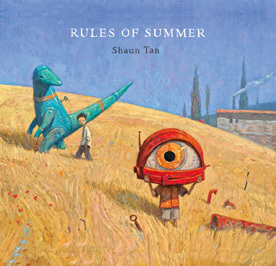 A couple of weeks ago, as I shelved picture books in the children’s department of the library where I used to work, I discovered Shaun Tan’s book, The Rules of Summer. The unusual artwork on the cover immediately caught my eye, and I indulged in a few stolen moments to read the book. What a treasure. The lean text tells the story of two brothers and the unique and arbitrary rules that govern their summer. The pictures, semi-abstract creations in oil and acrylic, relay a deeper story about the nature of the boys’ relationship. I believe the story speaks volumes about how people treat each other whether they’re children or adults, friends or family. It’s testimony to how far we will go in our relationships and exactly what we’ll tolerate and for how long. This may sound heavy for a picture book, but the beauty of the subtle message is that there is hope even when human nature ensures that this process repeats itself. When it does, we learn and grow, love and forgive. I’ve already enjoyed reading The Rules of Summer five times and have decided that I must own a copy for my private library. The book as a whole is an incredible work of art, and I’ll never tire of sifting through the many layers of the story, both words and pictures. One of my most prized possessions is the cast iron skillet I inherited from my beloved Grandma Smith. The skillet is twelve inches in diameter and easily weighs as much as my Kia Spectra. I have to use both hands to lift it, and if it weren’t so unwieldy, it would make one heck of a weapon. I know I surprised Grandma when I asked her if I could have the skillet when she broke up housekeeping. She was leaning toward giving rest-home living a try about a year after my Grandpa had passed. I assured her there was no rush and that I’d wait until she was completely ready to part with it. “What do you want that ole thing for?” she asked and laughed. I explained to her that is was infused with memories of her and all the delicious things she ever cooked in it. She smiled sweetly, I imagine still somewhat amazed that I’d asked for it, and said okay. The day my father brought it home to me was actually kind of a sad day. Grandma was still with us, but her days of clomping about the kitchen (she wasn’t exactly light on her feet) and directing the creation of large meals for family gatherings were over. Unfortunately, I let the pan sit for many years because I was too intimidated to use it. I wasn’t sure I could live up to my Grandma’s reputation as a great cook. Besides, I had a shiny set of Revere Ware Copper Bottom pots and pans. They were dishwasher safe; the cast iron skillet was not. 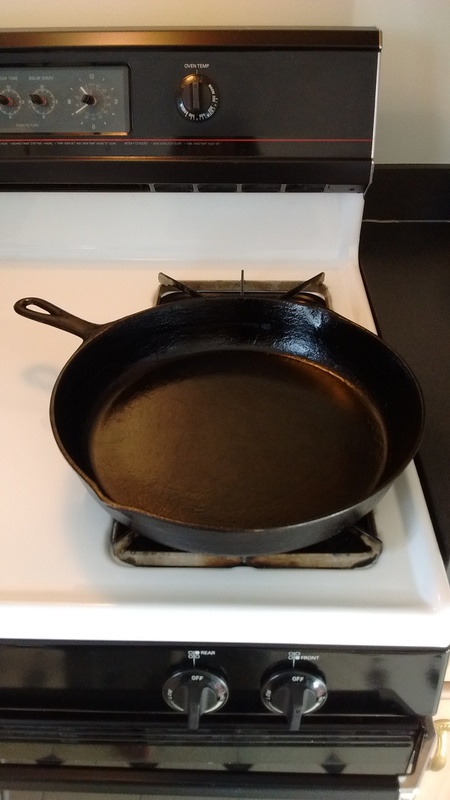 So, Grandma’s skillet languished in my stove, setting off the fire alarms every time I forgot to remove its oil-preserved self from the oven prior to preheating. I’m ashamed to say that I moved it to the storage shelves in the basement. Its presence was replaced with a non-stick skillet from my mother. A couple of years ago when I began writing my novel, The Secrets of Dr. John Welles, the skillet drifted back to the edges of my memory. As I mentioned in a previous blog post (Edible Fiction), I love to feed people, both real and imagined. 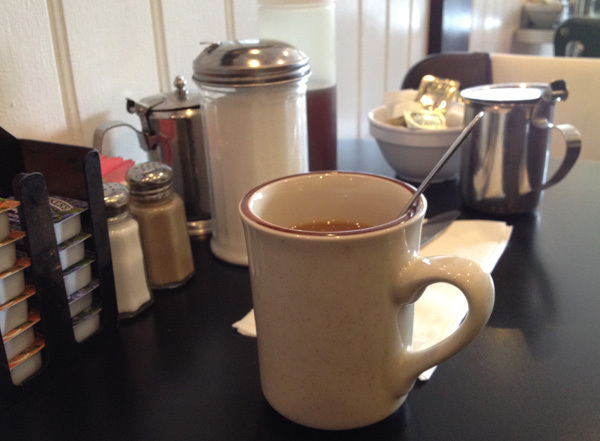 One of my characters, Collie Mercer, is responsible for a great deal of the food mentioned in my novel. Without realizing it, every time I wrote about Collie cooking, without even stating it, I pictured her using a large, cast iron skillet exactly like my Grandma’s. Black Beauty with a gleaming coat of oil. Long story short, the skillet, re-seasoned and currently in use, now reigns supreme in my kitchen. I never thought I could fall in love with a cooking implement, but I have. Who knew that cast iron was not only healthier for you, but the non-stick qualities put the new skillets to shame? And keeping it seasoned is not the chore I initially believed it to be. There is so much about cast iron that I want to share with you, but I’ll direct you to two books, The Cast Iron Skillet Cookbook by Sharon Kramis & Julie Kramis Hearne, and The New Cast Iron Skillet Cookbook: 150 Fresh Ideas for America’s Favorite Pan by Ellen Brown. What I love about these books, besides the delicious recipes, is the sentiment the authors express for the cast iron cookware they inherited. So, whether you’re starting out with a brand new piece of cast iron, rescuing an old relic from the back of someone’s cupboards, or just pulling out Grandma’s skillet to use for making dinner, get your hands on a piece of cast iron and fall in love with cooking all over again.